I just finished the first draw of my contribution to the book on Dutch advertising records, that Dolf Hell, Pim Reinders and I are trying to make. On the two CD’s, that come with the book, will be 40 of the best Dutch advertisement records, and there will be 60 more records published on a website. But it will take some time before the project is ready; even the copyrights have not been fully cleared yet. You don’t want to know how difficult it is to release some totally forgotten records, that nobody cared for in the past 50 years, on a CD. If you ever want to see what money, laws, big ego’s, ignorance are, make a CD with 40 Dutch advertisement records. While writing about these records, I listened to many of them again, and as always I fell deeply in love with these records. When the book+CD’s are out and the website is online, there will still be over a 1000 Dutch advertisement records that have not yet been published anywhere and probably never will. So, I thought I’d better start sharing some with you in this Soundtrack. A typical example of what I love about this genre is a sleeveless flexi-record that was released by a chain of supermarkets, named De Spar. 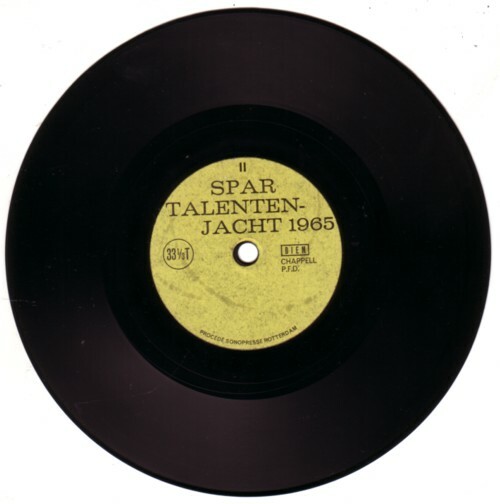 They had held a *talent contest in 1965, and some of the contestants are to be heard on this flexi-record. It is mystery to me why The Lads only finished as third. But I am happy that engaged in this contest at all, because their recording on this Spar record is the only recording of this band that I know of. omg This totally made my day! Het valt me mee dat ze geen Spario Spario zongen maar de Hava Naquila was ook zeer indrukwekkend! Net als bye bye Blondie Hidihehadiho! Ik heb dit plaatje nog. Mijn (helaas overleden) man Henk Peters was gitarist en zanger bij “the Lads” en die derde plaats verbaast mij nu ook. Maar ja, een halve eeuw geleden hè! groet, Thea Peters. Leuk dat je reageert, Thea! Ik vermoed dat maar heel weinig mensen dit plaatje kennen!